Atlantic Offshore has been awarded a five-year ERRV contract with oil company Shell Ltd, in the British sector of the North Sea. The company has secured an option for another five years. The last month has collected Atlantic Offshore contracts and options for a value of NOK 2 billion. – The contract with Shell UK commences in 2014. We will operate a well-equipped FSV-ship (Field Support Vessel), certified to rescue up to 300 people, on the Gannet oilfield east of Aberdeen, says CEO Roy Wareberg. The vessel will also contain a loading and storage area, to support Shell rigs nearby. 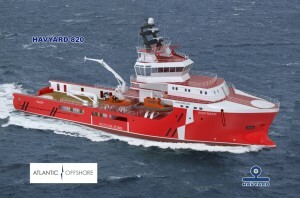 The HY820-design of the ship has been developed in close collaboration with Havyard Group. – First and foremost, it proves that we are a preferred and reliable partner. We have operated in this market since 1988. Additionally, we have a renewal program, which makes Atlantic Offshore one of the leading companies in terms of technology and functionality of the overall fleet. The fact that we meet and satisfy all certification and environmental requirements, makes us more attractive, says Wareberg. He notices also show that activity is increasing in the offshore market. Where the FSVs which will operate for Total and Shell UK will be built, will be decided shortly.